We’ve all seen it – hundreds of single-use paper towels piled up in a wastepaper basket or worse, all over a washroom floor. Using a handful of paper towels every time we dry our hands is often unnecessary and it certainly does nothing for the environment. Here’s how to dry your hands with just one paper towel and save time, money and precious resources. The secret to drying your hands, according to TED speaker Joe Smith, is to shake your hands several times (Smith recommends twelve) to remove most of the water from them, before folding a single paper towel and patting the remaining moisture from your hands. Cutting down paper towel usage may seem like an insignificant change in behaviour, but Smith believes that if everyone followed this process it could save around 571 million pounds of paper every year in the United States alone. For the record, that’s around 775 fully-loaded Boeing 747 planes! Of course, what’s most important is that hands are thoroughly dried, as bacteria find it harder to hitch a ride and grow on dry hands rather than damp ones. Hand hygiene saves lives and as such, it really is one of the most noble uses for paper towels! Therefore, those working in healthcare and food preparation environments may need to use more paper towels to ensure thorough hand hygiene practice. 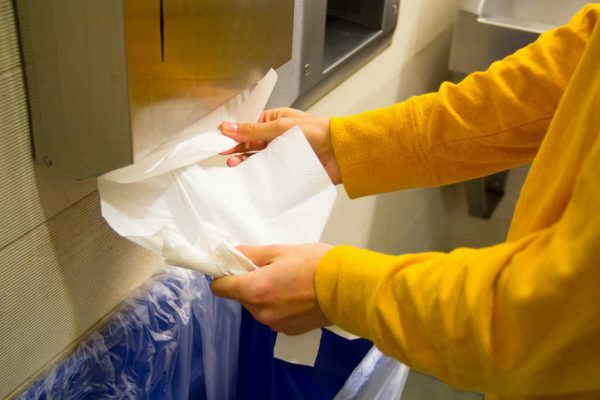 There are a number of other ways to reduce the amount of paper towels going into landfill. One of the easiest is to recycle, or even compost, the contents of your washroom wastepaper bins. Another is to use recycled paper towels. Even a simple sticker on paper towel dispensers can remind washroom users to stay mindful of their usage and take one sheet instead of four. Of course, one of the easiest ways to cut down on paper towel usage in your commercial washrooms is to install electric hand dryers in the space. High speed hand dryers, in particular, can cut paper towel use by up to 98% and many of our quality Mediclinics brand use only around 20% of the energy needed by more conventional models. The Davidson Washroom team can help you find the most suitable and sustainable models for your commercial washroom, so get in touch on 02 9648 3570 today.